In this heroic gaslamp fantasy, superhuman abilities bring an adventurous new dimension to 1820 London, where an outlaw speedster and a master of illusion do battle to decide who will own the city. Sign up for K.M. 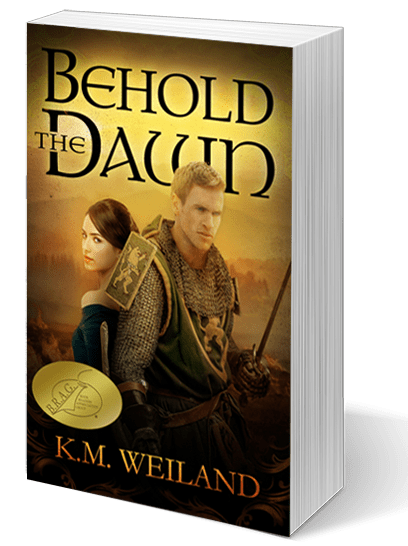 Weiland’s mailing list and claim your free copy of her medieval epic Behold the Dawn. Learn about K.M. Weiland's novels, including her latest release Storming, a historical/dieselpunk adventure about a 1920s biplane pilot fighting off storm-wielding sky pirates. Get a behind-the-scenes glimpse at what it's like to be an author, what story K.M. Weiland is currently working on, as well as special deals and contests just for readers. Find recommended reading, interviews and features, and fun free stuff! What are readers saying about K.M. Weiland's books? "A truly magnificent story. Wayfarer brings to life the way many lived in 1800s London, poverty and riches, and everything in between. The gangs of London, with memories of 'Fagin' and 'pick-a-pocket-or-two.'" "I LOVE IT!!! I mean it's great. Funny. Wonderful. [Weiland is] an amazing writer. This might be the best book I've read this year." "Relentless action fantasy with a hint of steampunk." "WOW!!!!! [S]imply took my breath away, all the way from the tourney on page one to the heart-stopping fight...! Find out what's happening in K.M. Weiland's world.